As a film and television prop/costume aficionado the Bauer hooded jacket is by far the holy grail of 24 memorabilia out period, synonymous with its character?s namesake it stands as the definitive must item for any fan of the series. The original jacket was only produced in limited quantity and are no longer manufactured, most auctions you?ll find an original are ludicrously overpriced and quickly becoming a rarity, thankfully Magnoli has level the playing field. The jacket is quite stunning and comfortable as the material breathes well; very versatile in most climate conditions and the fit of the jacket to my measurements was fantastic and worth the short wait. 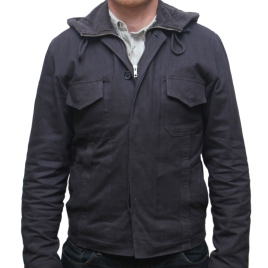 I highly recommend this item for any 24 fanatics or anyone that simply loves a great jacket.